David is the Vice President, Sales for IEP Technologies, part of the largest industrial explosion protection group in the world. 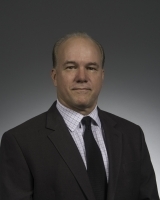 David has been with IEP Technologies since 1986, as a field engineer, a system design engineer, and a Regional Manager, covering central USA and Canada. David has served as a Technical Committee member of NFPA since 1991, including NFPA 652 (Fundamentals of Combustible Dust)since its inception. He has written numerous papers on explosion prevention and protection that have been published in a wide range of trade journals related to bulk and powder processing and handling.